Parliament reconvenes in DRC today, and thousands of adoptive parents are hoping and praying that this means DGM will begin issuing Exit Letters again. When DGM suspended the issuance of Exit Letters last September, it stated a need to probe deeper into the adoption process and redefine laws to limit fraud and corruption. For the entire year since then, rumors have flown around regarding when those laws would be redefined or rewritten and what they might be. Here we are, almost a year to the date later, and rumors are still flying around. Most rumors lead us to believe things will move in a positive direction soon, but that doesn't necessarily mean the reconvening of Parliament will lead directly to huge leaps of progress. (An attorney at our agency said new laws take 1-3 years to put into place.) It also doesn't mean that DGM will fling its doors open wide and allow all adopted children to go home immediately. Things take time. A TON of time. Although I desperately want our Sweet C home in our arms--like NOW--I believe I can say with confidence that I am trusting God in the wait. He has proven himself to me, personally, OVER and OVER again, and he has proven himself throughout history thousands and thousands of times over. I have no reason to believe this situation was a surprise to him or that it is out of his hands. It is very much in his absolute control, even though it's hard to understand it. Trusting doesn't mean I don't do everything humanly possible to bring about change that will bring C home--yes, calling Congressmen included--but I recognize that human efforts mean nothing if not inspired and directed by God and his divine and perfect plans. Trusting doesn't mean I don't feel the weight of the wait. It is sometimes very heavy on my heart. But I know in the end this will all be a blur and incredibly worth it. And Sweet C will always have a family of her own who will love her forever. This is something that's worth waiting (sometimes even fighting) for. Please pray for adopted children (safety and health!!) and families as they wait, as well as the leaders DR Congo who are making important decisions for all of us who are waiting to have all of our children under one roof. 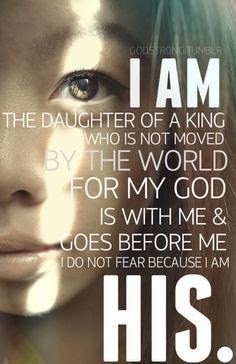 Fear does not hold us if we are His.